• For quantitative determination of creatinine and evaluation of drug effects on creatinine metabolism. • Sensitive and accurate. Use 30 μL samples. Detection limit 0.10 mg/dL (8 μM) creatinine in 96-well plate assay. • Simple and high-throughput. The procedure involves addition of a single working reagent and incubation for 5 min. Can be automated as a high-throughput assay for thousands of samples per day. • Improved reagent stability and versatility. The optimized formulation has greatly enhanced reagent and signal stability. Assays can be executed in 96-well plate or cuvet. • Low interference in biological samples. No pretreatments are needed. Assays can be directly performed on raw biological samples. • Creatinine is synthesized in the body at a fairly constant rate from creatine, which is produced during muscle contractions from creatine phosphate. In the blood, creatinine is removed by filtration through the glomeruli of the kidney and is secreted into urine. In healthy individuals, creatinine secretion is independent of diet and is fairly constant. The creatinine clearance test has become one of the most sensitive tests for measuring glomerular filtration rate. In kidney disease, creatinine levels in the blood are elevated, whereas the creatinine clearance rate and hence the urine levels are diminished. Creatinine test is most widely used to assess kidney function. Simple, direct and automation-ready procedures for measuring creatinine concentration in biological samples are becoming popular in Research and Drug Discovery. BioAssay Systems creatinine assay kit is designed to measure creatinine directly in biological samples without any pretreatment. The improved Jaffe method utilizes picrate that forms a red colored complex with creatinine. The intensity of the color, measured at 510nm, is directly proportional to creatinine concentration in the sample. The optimized formulation substantially reduces interference by substances in the raw sample. 1. If I understand correctly, there is no need to perform a full creatinine standard calibration curve. The 2 mg/dL point will suffice. Is this right? Yes, the reaction is linear from 0 up to 50 mg/dL and a single 2mg/dL creatinine standard is sufficient. 2. Is this assay compatible with plasma prepared using EDTA? Yes, EDTA plasma is compatible with the assay. 3. I have read the specification sheet and I didn't find details about the temperature of the reaction. Due to it is a kinetic reaction, I am wondering if the 5 minutes incubation should be done at 37°C or room temperature is fine. Do you have some additional information about this? We normally perform the assay at room temperature but you can run it also at 37°C if this is more convenient. The absorbance values will be higher at 37°C, but because you run the standard and the samples under the same conditions, a change in temperature has no effect on the accuracy of the measurement. It is more important to keep the time between adding the reagent and the OD measurement about the same for all samples, e.g. by using a multichannel pipettor. 4. I would like to know if the QuantiChrom Creatinine Assay kit can be used for urine samples from rat and mouse. Yes, this assay can be used for urine samples from any species including rat and mouse. 1. Stanic, AK et al (2006). Immune dysregulation accelerates atherosclerosis and modulates plaque composition in systemic lupus erythematosus. PNAS 103(18):7018-23. Assay: Creatinine in Mouse Serum (Pubmed). 2. Grimm, PR et al (2009). Hypertension of Kcnmb1-/- is linked to deficient K secretion and aldosteronism. PNAS 106(28):11800-5. Assay: Creatinine in Mouse serum (Pubmed). 3. Lorch, G et al (2007). Inhibition of epidermal growth factor receptor signalling reduces hypercalcaemia induced by human lung squamous-cell carcinoma in athymic mice. Br J Cancer 97(2):183-93. Assay: Creatinine in Mouse urine (Pubmed). 4. Andonegui, G et al (2009). Characterization of S. pneumoniae pneumonia-induced multiple organ dysfunction syndrome: an experimental mouse model of gram-positive sepsis. Shock 31(4):423-8. Assay: Creatinine in Mouse plasma (Pubmed). 5. Jaruga, P. and Dizdaroglu, M (2010). Identification and quantification of (5’R)- and (5’S)-8,5’-cyclo-2’-deoxyadenosines in human urine as putative biomarkers of oxidatively induced damage to DNA. BBRC 397(1): 48-52. Assay: Creatinine in human urine (Pubmed). 6. Hauser, PV et al (2010). Stem cells derived from human amniotic fluid contribute to acute kidney injury recovery. Am J Pathol. 177(4):2011-21. Assay: Creatinine in Mouse serum (Pubmed). 7. Abrass, CK et al (2010). Laminin alpha4-null mutant mice develop chronic kidney disease with persistent overexpression of platelet-derived growth factor. Am J Pathol. 176(2):839-49. Assay: Creatinine in Mouse urine (Pubmed). 8. Zhang, SX et al (2006). Therapeutic potential of angiostatin in diabetic nephropathy. J Am Soc Nephrol. 17(2):475-86. Assay: Creatinine in Rat urine (Pubmed). 9. Gilliam-Davis, S et al (2007). Long-term AT1 receptor blockade improves metabolic function and provides renoprotection in Fischer-344 rats. Am J Physiol Heart Circ Physiol. 293(3):H1327-33. Assay: Creatinine in Rat serum (Pubmed). 10. Socha, MJ et al (2007). Secreted protein acidic and rich in cysteine deficiency ameliorates renal inflammation and fibrosis in angiotensin hypertension. Am J Pathol. 171(4):1104-12. 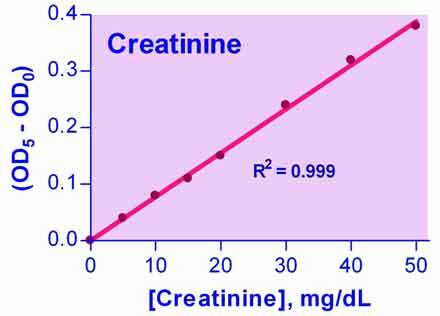 Assay: Creatinine in Mouse urine (Pubmed). 11. He, Z et al (2008). Interleukin-18 binding protein transgenic mice are protected against ischemic acute kidney injury. Am J Physiol Renal Physiol. 295(5):F1414-21. Assay: Creatinine in Mouse serum (Pubmed). 12. Zafar, I et al (2009). Long-term rapamycin therapy in the Han:SPRD rat model of polycystic kidney disease (PKD). Nephrol Dial Transplant. 24(8):2349-53. Assay: Creatinine in Rat serum (Pubmed). 13. Tang, TC et al (2010). Impact of metronomic UFT/cyclophosphamide chemotherapy and antiangiogenic drug assessed in a new preclinical model of locally advanced orthotopic hepatocellular carcinoma. Neoplasia 12(3):264-74. Assay: Creatinine in Mouse urine (Pubmed). 14. Xu, J et al (2010). FVB mouse genotype confers susceptibility to OVE26 diabetic albuminuria. Am J Physiol Renal Physiol. 299(3):F487-94. Assay: Creatinine in Mouse serum (Pubmed). 15. Sahan-Firat, S et al (2010). 2,3’,4,5’-Tetramethoxystilbene prevents deoxycorticosterone-salt-induced hypertension: contribution of cytochrome P-450 1B1. Am J Physiol Heart Circ Physiol 299(6):H1891-901. Assay: Creatinine in Rat Serum (Pubmed). 16. Kim JW, et al (2010). Increased urinary lipocalin-2 reflects matrix metalloproteinase-9 activity in chronic hepatitis C with hepatic fibrosis. Tohoku J Exp Med. 222(4):319-27. Assay: Creatinine in human urine (Pubmed). 17. Wang J, et al (2011). Elevated oxidative damage in kitchen workers in Chinese restaurants. J Occup Health 53(5):327-33. Assay: Creatinine in human urine (Pubmed).